Discretely concealed in a private house in Palermo Soho is La Restinga – a high-end appointment-only men’s fashion boutique. Every piece of this Argentine luxury brand’s collection – that comprises of ready-to-wear, accessories and tailored suits - is designed and created with an acute attention to detail, using high quality imported Italian fabrics and the finest wools and leather. As you shop, enjoy a tumbler of whiskey, glass of wine or champagne from their fully-stocked private bar and take time on the gorgeous leafy terrace to enjoy a Cuban cigar. An antiques warehouse during the week transformed into a closed-door restaurant on the weekend, La Pasionaria in Palermo Soho offers an atmospheric dining experience set amongst an eclectic assortment of antique treasures from another era (all of which are for sale and you will want to buy). To accompany the set menu of dishes with a distinctly Asian theme, they invite a different music act each week to perform live, from jazz to bossa nova beats. Godoy Cruz 1669, Palermo Soho, open Fridays and Saturdays with reservations only. The underground Uptown bar offers much more than just a cocktail. The experience begins by descending into a replica of New York’s Manhattan subway station. Once exiting the train the inside is even more impressive as you find yourself in an elegant lounge bar setting with an impressively long bar and extremely attentive bar tenders. The food menu is inspired by the Little Italy and China Town neighbourhoods in New York and is the product of chef Dante Liporace, who has previously cooked for Argentine President Macri in the Casa Rosada. This dynamic studio space is shared by Mai Solorzano, Jardin Estampas, TAN.TAN and Belen Milerama, with a focus on artisan, sustainable design. All the pieces are handmade by the designers themselves, from Mai’s unique jewellery creations crafted from sterling silver, brass, semi-precious stones, wood and other recycled materials to fashion label Jardin Estampa’s hand-dyed clothing and accessories (using all-natural dyes) that perfectly complement each other. TAN.TAN offers beautiful notebooks and diaries hand-painted by local artists, while Belen Milerama hand mixes aromatic tea blends and flavourful spice mixes for the kitchen. The appointment-only workshop is a hands-on environment for creatives where you are sure to find some unique souvenirs from the Buenos Aires shopping scene. Argentine artist Maria Laura Pini is known for her colourful, quirky paintings that often feature women. Working from her charming workshop in the more peaceful northern suburbs of Buenos Aires, she paints on a whole variety of mediums, from large canvases to ceramics. 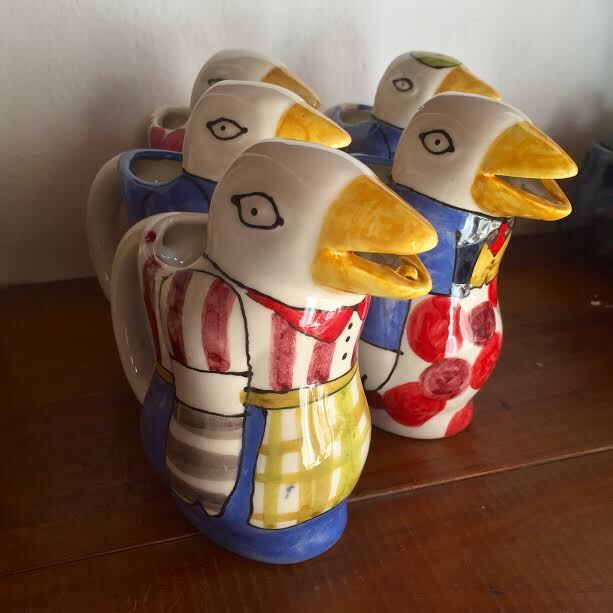 She has a whole space devoted to her vibrant painted ceramics, from large platters to mugs, bowls and playful penguin jugs (an iconic Buenos Aires shopping must-buy) that will sit in your kitchen as a fond reminder of your holiday in Argentina. To gain access to the secret spots on the Buenos Aires shopping scene, book a shopping trip with us by clicking on the Contact Us button below.